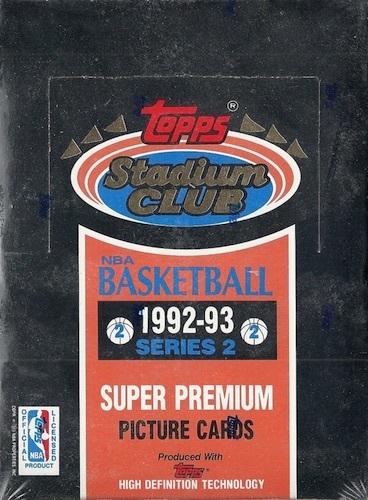 1992-93 Stadium Club Basketball will never revisit the highs it once saw, but the set remains relevant thanks to several key rookies and one of the earliest insert chases among basketball collectors. Headlined by Shaquille O'Neal rookie cards and Beam Team inserts, '92-93 Stadium Club is arguably the top basketball product of that season. 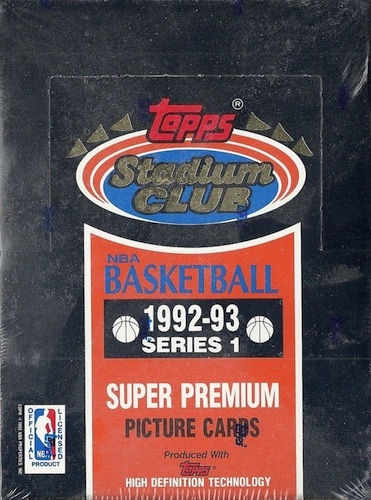 Featuring a full-bleed image and simple, if dated, design, the 1992-93 Stadium Club Basketball base set consists of 400 cards. The release is broken into two different series, with 200 cards in each. 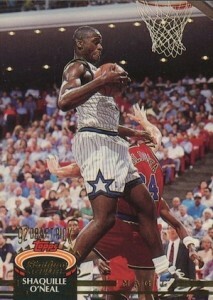 The key card in the base set is the rookie card for Shaquille O'Neal. Alonzo Mourning is currently the only Hall of Fame option for rookie collectors, but that will change once Shaq is eligible. Other notable RC options include Latrell Sprewell, Robert Horry and Christian Laettner. Very similar to 1992 Stadium Club Football, the card fronts make use of a Topps Stadium Club logo and gold foil at the bottom. Most rookie players are distinguished with an added "92 Draft Pick" text but this was inadvertently left off some of the first-year players. The backs are a little busy given the large basketball background. Also of note, Topps included an image of each player's Topps rookie card on the back. 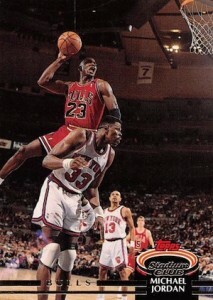 While this can be a nice flashback for baseball or football, for most NBA players, the card shown came from the same year in the base 1992-93 Topps set as it was the first basketball release from the company since 1981-82 Topps. Although there is not a lot of variety in the 1992-93 Stadium Club Basketball base set, several checklist cards and one subset mix things up slightly. The 20-card Members Choice subset (#191-210) is split into two groups that fall at the end of Series 1 and the beginning of Series 2, respectively. The cards display the Members Choice tagline at the bottom and the foil has a holographic effect. However, they are not all that different from the base cards. Likely helped by the one-note feel of the product, Beam Team inserts still stand out in a great way in comparison to the base cards. 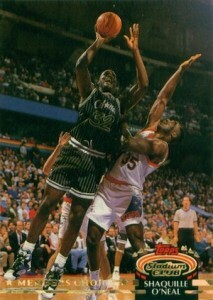 The only insert in 1992-93 Stadium Club Basketball, the Beam Team design was intended to pay homage to a laser-filled halftime show at select games during the latter half of the 1992-93 season. Averaging around 1:36 packs, the 21-card set was originally a hot commodity for collectors that commanded huge sums. 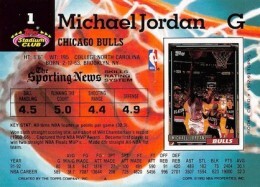 Prices have softened over time, but the Michael Jordan Beam Team is still in strong demand and the insert set also offers one of the most popular first-year cards for Shaquille O'Neal. Collectors should be aware that all the rookie cards and the lone insert are found in Series 2. This includes all three Shaquille O'Neal cards. There is also a Members Only factory set that parallels all 400 cards and the Beam Team insert. The Members Only base cards feature an additional gold foil logo in the top corner and the Beam Team cards include a more-subtle watermark. 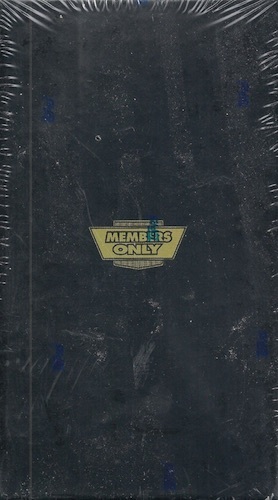 The full Members Only set also came with an official 1992-93 Stadium Club Basketball binder and a certificate of authenticity numbered to 12,000. Other reports peg the Members Only print run slightly lower at 10,000 copies. 400 cards. Shop for base sets on eBay. Series 1 = cards #1-200; Series 2 = cards #201-400. 21 cards. 1:36 Series 2 packs. Here are the best deals on Members Only factory sets currently listed on eBay. 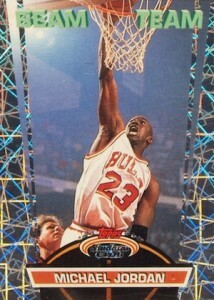 Both this set and the 1992-93 Topps flagship didn’t miss labeling some rookies- it was done on purpose. Only players drafted in that season’s draft were notated- undrafted players or players drafted in previous seasons but didn’t make the NBA until 1992-93 were not labeled as rookies at all. Billy Kingsley � Not correct. Christian Laettner – 3rd overall pick in 1992 NBA Draft, Adam Keefe – 10th overall in 1992, Bryant Stith – 13th overall in 1992, Tracy Murray – 18th overall in 1992, and several more do not feature the ’92 Draft Pick label. Just as I stated in the article, some true first-year players (i.e. those that were drafted in 1992) had the text left off and I am not talking about the undrafted players or those from another draft.